The Pentax 645D is a camera that sort of slid quietly onto the photographic stage, metaphorically speaking. First announced as a concept, there were numerous delays before it appeared in 2010 and then it didn’t really grab any headlines. Had everyone got fed up with Pentax’s indecision about the camera? Would they commit to it long term? It certainly didn’t do a lot to bolster anyone’s faith in how long Pentax would support it as a system. 645 was a misnomer as the sensor wasn’t 6x4.5 as the name would imply, rather a reduced size Kodak CCD (the same as in the Leica S2) measuring 44mm x 33mm (less than 63% of full frame film or the sensor in the PhaseOne IQ180 or Hasselblad H4D60). Its fixed back design meant the back couldn’t be used on a technical camera therfore making it closer to a large DSLR, only a lot more expensive. Pentax’s early indecision I think proved costly if they were trying to compete with PhaseOne, Hasselblad, Leaf etc with their established support structures. At its initial price the Pentax 645D could be seen as an expensive gamble especially if Pentax later decided to abandon the camera. The 645D was dealt what many may have seen as a sucker punch from below when out of the blue the Nikon D800 exploded onto the scene with its class leading 36mp resolution. Suddenly the Pentax looked very overpriced and, on paper, underspecified. A number of reviews and test chart comparisons seemed to show the D800 beating the Pentax on resolution. However there is more to using a camera than photographing test charts. If its overall image quality coupled with excellent ergonomics help the photographer in his or her craft, then arguing over the finer point of exactly how many lpm it can resolve is less important. It’s pictures not pixels that matter. I was one of those photographers who had initially overlooked the Pentax, going down the Hasselblad H digital road (a decision I now regret). 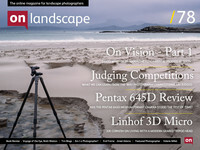 When I was at the Photography Show I managed to briefly escape from the Linhof Studio / Onlandscape stand and got chance to take a closer look at the 645D. Pentax’s announcement of a 50mp CMOS version had piqued my interest and I realised the camera warranted a reappraisal. Paul Waller of Commercial Cameras http://www.commercialcameras.co.uk kindly arranged the loan of a 645D so I could briefly test out the cameras ergonomics in the field in advance of a larger review of the 645Z when it becomes available. I had the Pentax for a few days, just enough to get the hang of it as a camera and found it very pleasurable to work with. This is a very impressively built camera that shows its heritage. It is not going to win any style awards, boxy is the first impression but in use it means business. The viewfinder is fantastic and for me is one of the most important things to consider when assessing a camera. If I can’t visualise an image then all manner of clever gadgets and features become irrelevant. As I mentioned before the 645D fell a little short when compared to other digital medium format cameras with their modular design. However reassessing the 645D as a DSLR on steroids is a different proposition - the sensor is 168% larger than that in a D800. When I use my D800 for landscape work I am nearly always shooting in 5x4 crop mode which masks off part of the viewfinder and reduces the resolution to around 30mp. The format of the Pentax is closer to my ideal format so the non-cropped viewfinder seems huge when compared to the D800. In nearly all aspects of use the Pentax is identical to my D800 - okay the AF is a bit basic but as I only ever use the centre AF point anyway it didn’t bother me. It is certainly built a lot better than the Nikon and one of the simplest but hugely appreciated aspects is the inclusion of a tripod socket on the side of the camera - no need for expensive L-brackets here. The Pentax has two SD card slots. At the time of its launch the non-use of compact flash was sneered at by some people but in hindsight this seems to have been a sensible choice as in all probability SD will become the dominant card format especially with most laptops now including SD card readers. The camera can shoot both jpg and raw (dng) files and I was really impressed with the out of camera colours, there is something about the quality of files that come from CCDs at lower ISO. However with its inherent noise at higher ISOs, compared to CMOS, a CCD is less versatile. With the switch to CMOS in the new 645Z, the camera will gain live view which will revitalise the Pentax. The ergonomics will be basically the same as the 645D but include weather sealing and an articulated rear lcd. It is the basic ‘down to business’ approach to the feel of the Pentax that I really liked. It may sound silly to say this but I almost felt like I was shooting with a film camera - mind you that may be down to the relatively long wait for a review image to appear on the rear lcd. In fact I stopped waiting and got on shooting as the buffer allows the camera to still shoot. The camera is nicely balanced in hand and I would be happy working with it hand held when shutter speeds permit. This will be more of an option with the 645Z and better higher ISO performance. Interestingly the shutter is quieter than my Sony A7R. When shooting in portrait format the rear lcd information changes orientation (though not in the viewfinder sadly). There is a level gauge on the rear lcd which I found very useful with the camera tripod mounted. In the brief time I had the Pentax I was very impressed with the overall image quality. In fact it performed exactly as I thought it would as at its core is a proven Kodak designed sensor. There seemed to be enough headroom in the raw files (at lower ISOs) to be able to push the exposure in Lightroom or Camera Raw. What was a bit more unexpected was how pleasing the colours were on the camera jpgs an option not offered by my Hasselblad H series cameras while I had them. The cameras AWB certainly handled the scene below better than my Sony A7R. Apparently when the 645Z appears the original 645D will still be available and Pentax restructured pricing means they are getting quite aggressive now they are part of the Ricoh group. The new price for the 645D with 55mm lens is £5,000 including VAT and the 645Z will retail at £7,699 with lens or £6,799 body only (again including VAT). With PhaseOne and Hasselblad using the same Sony 50mp sensor as the 645Z but priced at £24,990 and £22,440 respectively the Pentax suddenly looks like a ‘bargain’. This pricing coupled with weather sealing, excellent build quality, bigger pixels compared to 35mm DSLRs, interchangeable focussing screens, articulated rear lcd and live view makes the Pentax an interesting option for landscape shooters and it maybe that this is the market Pentax has in its sights. Pentax are planning to increase the lens range to 17 lenses (if you include those originally designed for film); 12 primes and 5 zooms. In 35mm terms the zooms cover 26mm - 236mm and the primes 20mm - 315mm. For those who feel the need to go larger than 35mm but don’t want the pay the much higher costs of digital MFD then maybe Pentax has the answer. One of the nice things about being able to shoot jpgs alongside raw files is the option to produce in-camera black and white images. All that was needed here was a slight contrast boost in Photoshop. The ‘new ‘Z’ version will feature weather sealing and a tilting rear lcd. In addition to “weather sealing it will retain the excellent build quality, bigger pixels compared to 35mm DSLRs, interchangeable focussing screens, articulated rear lcd and live view makes the Pentax an interesting option for landscape shooters and it maybe that this is the market Pentax has in its sights. We will be taking a look as soon as we can get one to review.